Connecticut Trolley Museum, Want to be a Motorman? Shop the WEBS 45th Anniversary Sale—our biggest sale of the year! Save up to 50% on over 100 popular yarns for knitting, crochet, and weaving. Most sale prices end April 30 with new items on sale May 1. Happy April vacation week! Come visit us this week with the kids and enjoy a special promo to celebrate! Kids eat free with purchase of an adult meal. 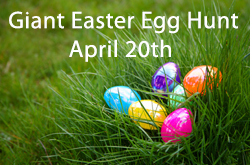 Join us for Eggstavaganza! A 4-Day Event beginning Friday, April 18 - Sunday, April 21. While you shop, pick up an egg in each area and receive either a free product or a secret discount! Pioneer Kids Week is Storrowton Village Museum’s new April school vacation program for ages 7-12. Kids will get to explore New England’s pioneer past and connect it to the present through fun hands-on lessons, activities and games. Hampshire Mall, the Easter Bunny! Springfield Museums, Stomp, Chomp, and Roar! Author Susan Verde’s I Am Human shows it’s okay to make mistakes while also emphasizing the power of good choices by offering a kind word or saying “I’m sorry.” Verde will lead a guided meditation in Bobbie’s Meadow after the storytime. Book signing to follow program. Can’t make it to the event? You may reserve signed books online or contact The Carle Bookshop atshop@carlemuseum.org. We are open all week normal hours offering our 3 races at $40 dollars Tuesday-Friday. Science Rocks: “Peeps Experiments” West Springfield Public Library, Park St. presents "Science Rocks! “Peeps Experiments” on Friday, April 19, 3:30 to 4:30 p.m. For children ages 9-12. Having fun with scientific methods. Register by calling 413-736-4561. The program is free. The Old Fashioned Fish and Chips Dinner will be held on Good Friday, April 19, from 4:30 to 6:30 p.m. Join us in the Elms College Dining Hall for a delicious dinner of hand-battered fish, hand-cut fries, coleslaw, beverages and dessert. The event costs $25 for adults and $10 for children 12 and under. The proceeds from this event benefit the Elms College Alumni Association in support of alumni, programming, scholarships, and the advancement of Elms College. Illusions and Magic with Eric Anderson at The Starting Gate at GreatHorse on Friday, April 19. You will leave his show muttering to your friends: "How in the heck did he do that?" $25 Call for reservations 413-566-5158. 8am-5pm LOCATION: Mallary East & West ADMISSION: FreeAll breed dog shows sponsored by the South Windsor Kennel Club, Pioneer Valley Kennel Club & the Springfield Kennel Club. Western Mass Easter Egg Hunt!! Six Flags, Easter Weekend Celebration! Holyoke Mall, Kids Health & Safety Fair!